WATCH DESIGNED SPY CAMERA: Wearable watch shaped camera,with built-in invisble lens, nobody would suspect it is a camera in your hands.The undetectable mini hidden camera allows the device to capture images and videos freely at any situation. 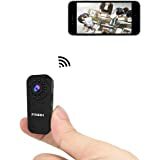 FULL HD VIDEO AND PHOTO CAPTURE: Perfectly hidden video recorder,generate video and photos with 1280x720P high-definition resolution, saved photos in JPG format and recording video in AVI format. INTERNAL 16GB STORAGE: Come with a 16GB MicroSD card, support max 32GB storage as well, super easy to read the video files on most of pc or laptop,no need for extra software or driver installation. SUPER WIDELY USE: This spy watch is suitable for interviews, life records, entertainment and leisure records, sports records, class records, outdoor adventure records and so on. This surveillance device is widely used in business negotiation and crime investigation, which keeps evidence for business and court. 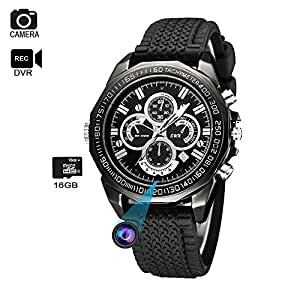 WHAT YOU GET: KAPOSEV camera watch,usb data charging cable,user manual,30-days free return or replacement,7/24 friendly customer care.Note:The spy camera has bulti-in rechargeable battery,ensure full of battery before use;If the camera has no response, please reset the device. Long press the on/off button 3 seconds, turn on the camera for standby mode. then press the on/off button again, stop recording and save the video file in standby mode. In any mode, long press the mode switch button(over 2 seconds),the red light and two blue lights flash 3 times then go out, it will start motion detection recording mode.It will save each file in every 30s. In first 30s,it is loop recording,then became motion detection mode.Short press the on/off button to save the file. Short press the mode switch button to switch the working mode freely. Warranty: ALL KAPOSEV camera enjoy 30-days free return or full replacement and 1-year guarantee period.